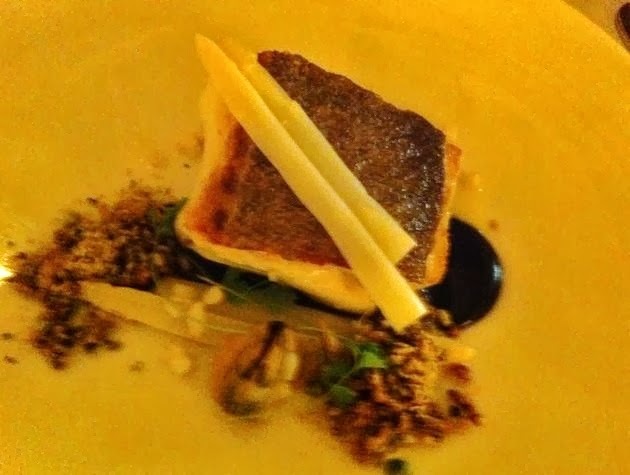 A recent visit to" L'Ecrivain Restaurant " the Michelin Star establishment run by Head Chef Owner Derry Clarke and his charming wife Sally Anne Clarke , on Lower Baggot street , Dublin 2 was once again a fantastic evening with great food and superb service . We were warmly received on arrival and offered whether to go up to our table immediately or to have an aperitif at the bar . We opted to go straight up to our table , where we settled into the soft couches and comfort of the dinning room . The place was busy and there was a great vibe . Our friendly and knowledgeable waiter talked us through the menu . In fact, he was most attentive throughout the whole evening . The owners were present as well and were most charming . Our first course of Scallops, Smoked Roe Creme fraiche , Crisp Frog leg , Sea buckthorn & Apple arrived on a speckled Mongolfiere plate. 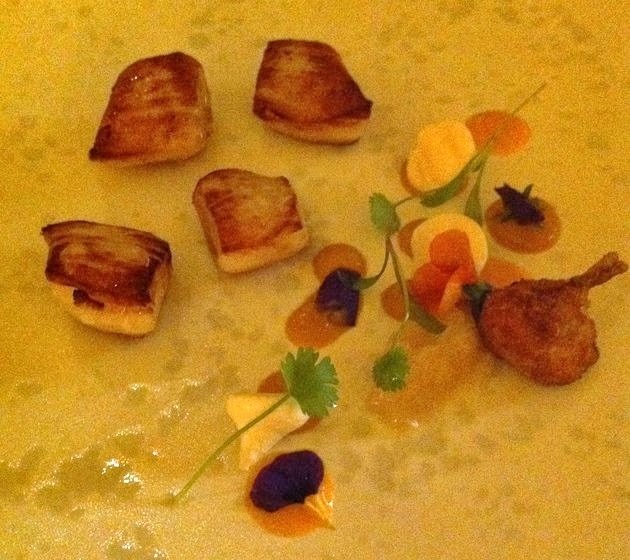 It was a delight to look at and did not disappoint , Beautifully seared Scallops , moist and melt-in-the-mouth , lovingly coupled with the smoked roe creme fraiche . The accompanying Crisp Frog leg was succulent and just delish with the apple gel . The next course of Chicken & Foie Gras Terrine with Quinoa, Apple , Hazelnut dressing was a luxuriously slab of velvety terrine and packed full of flavour . Whereas the quinoa and hazelnuts added a lovely contrast of textures , the apple , hazelnut dressing offered a spot on amount of zing . The Pork . 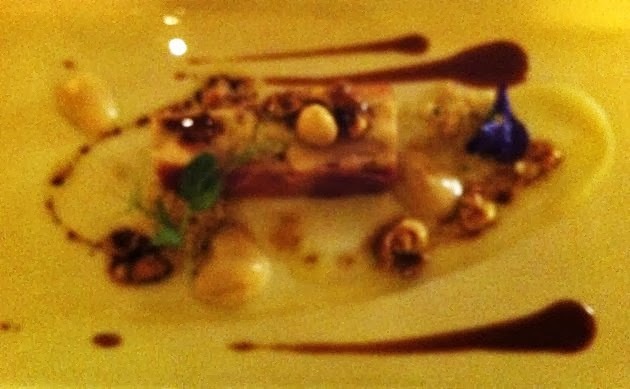 Crubeen , Carrot & Liquorice puree, Grapefruit and Apple gel , Braised Chicory , Smoked Bacon Popcorn was pure Haute Couture . Elegant and equally pleasing to the eye . Beautifully slow roasted , thick , treacly crackling skins , alternated with buttery pork flesh , which was off set nicely by the bitterness of the braised chicory and sweet apple gel . The accompaniment garnishes of Pig's ear and cheeks crispy croquettes were sensational , bursting with flavours , textures, singing and dancing on the palate . 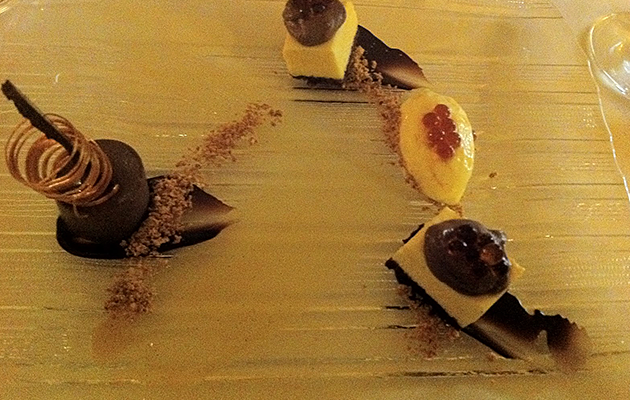 More impressive presentation were to come with the arrival of our desserts. 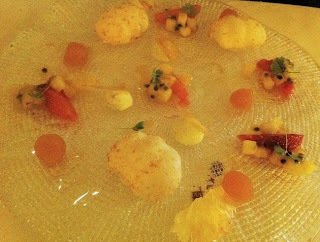 A Coconut Pavlova , Fruit salsa with black Cumin , Mascarpone Cream , Black Cardamon spiced syrup was truly memorable both for it's delicate Lacey presentation and it's wonderful balance of textures and flavours. The meringue were flawless , crisps thin shells with marshmallow 'ish soft fluffy interiors , coated with the spiced syrup , it was divine . 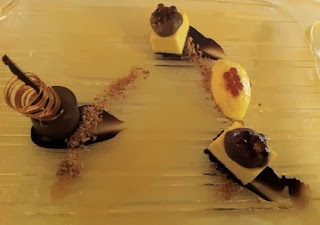 The Chocolate , Passion fruit espuma , Caramel , Cardamon feuilletine & Caramel caviar was a sumptuous end to a satisfying meal . Melt- in-the-mouth Chocolate Opera , the silkiest mousse . Almost too rich but incredibly sensuous and even better to taste . In all , this was a memorable evening , fabulous food and exquisite service . Highly recommend.